Despite the exit of Daniel Agger from the Premier League in 2014, he is still missed at Anfield. Admitedly Liverpool's defence has improved markedly since Jurgen Klopp spent a massive sum of £75 million on Virgil van Dijk during the transfer window in January but behind him the resources are thin, and they could definitley do with someone as reliable as Agger was as a backup. A great competitor and fan favourite, Daniel Agger was often the first one to be named on the team-sheet for a procession of managers working at Anfield, and it is testament to his abilities that he played for them from 2006 all the way through to 2014. The one area you would want to improve in his game was his fitness - which also utlimatley proved to be his downfall. In the era of the modern Premier League, not being able to play a match every 3 or 4 days quickly became his downfall - prompting him to leave the club aged just 29, and retire altogether from football (even though it waswith hometown club Brondby 2 years later, when he was only 31 years old! His goalscoring record against Manchester United was also solid - he had such a good record against them that he was often one of the pundit's top 'dark horse' picks to score! Agger managed to pull on the red shirt for the last time for Anfield in a spectacular 5-5 draw in a charity match played against Bayern Munich. The player joked that, whilst he used to be able to play a game like that (in front of a capacity crowd) every week, these days once a year feels like enough! He starred alongside Steven Gerrard, Steve McManaman and Robbie Fowler, with the performance rolling back the years. 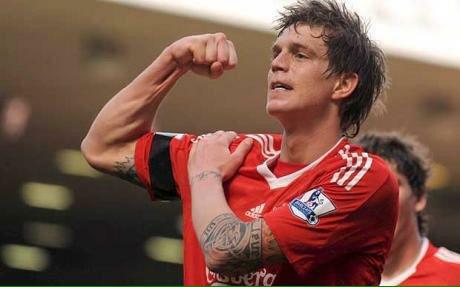 His never say die attitude and willingness to put himself in harms way for the cause are just two of the reasons that fans would do anything to have a fit-again Agger (or a clone) in Klopp’s team. With his 'Never Walk Alone' tattoo, he proved that he loved the club and fans loved all the more for it! It was great to see Agger back at Anfield and one of the fans was elated - his son Kasper got a chance to see the renowned player for the first time. How Klopp could do with a smiliar player should VVD gets injured.